People living with diabetes are being warned they might be "unwittingly" storing their insulin incorrectly. According to new research, domestic refrigerators could pose a risk to insulin quality as temperatures inside can often drop below recommended levels for insulin storage. 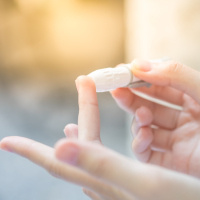 Diabetes UK says further research is needed into the effect of temperature fluctuations on insulin, the medication used by people living with Type 1 and Type 2 diabetes. A total of 338 diabetic patients were involved in the study, presented at the European Association for the Study of Diabetes annual meeting in Berlin. Insulin should be kept between 2C and 8C (36F to 46F) in refrigerators to keep it at its best, or between 2C and 30C (30F to 86F) when carried around in a pen or vial, researchers said. Temperatures were monitored in both settings for an average of 49 days as part of the study. The research found that insulin stored in a fridge was outside of the recommended temperature range 11% of the time, equating to around two hours and 34 minutes per day, compared to eight minutes per day for insulin carried around on the person. The temperature of the insulin dropped below 0C for the equivalent of three hours every month, the research also found. Lead author Dr Katarina Braune, from Charite in Berlin, one of the largest university hospitals in Europe, said more research was needed to examine how this affected the insulin and patient outcomes. "Many people with diabetes are unwittingly storing their insulin wrong because of fluctuating temperatures in domestic refrigerators," she said. "When storing your insulin in the fridge at home, always use a thermometer to check the temperature. Long-term storage conditions of insulin are known to have an impact on its blood-glucose lowering effect." Dan Howarth, head of care at Diabetes UK, said the findings were not yet a cause for concern and called for further research into the impact of temperature fluctuations during domestic storage. He added that patients should "continue storing their insulin in line with companies' recommendations, including checking their fridges regularly and setting them to the right temperature."